I am more than excited to be part of this outstanding group of exercise enthusiasts! Not only am I part of a supportive community of women around the United States (and beyond), I also received some fun swag. First of all - my most favorite tank in the world. I wear this tank just about everywhere - running on the trail, doing yoga, hanging out at home, working in the garden, running errands, and working at the gym. And PINK shoelaces. Spreading the Sweat Pink love with PINK shoelaces is such a clever idea. 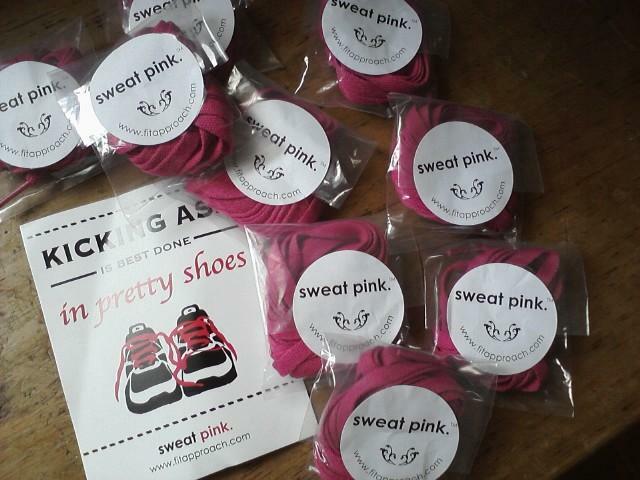 I'll be spreading the Sweat Pink love locally. First I'm starting with my girls. Then I'm going to start passing them out at local events, on the rail trail and when I work at the KVHC. 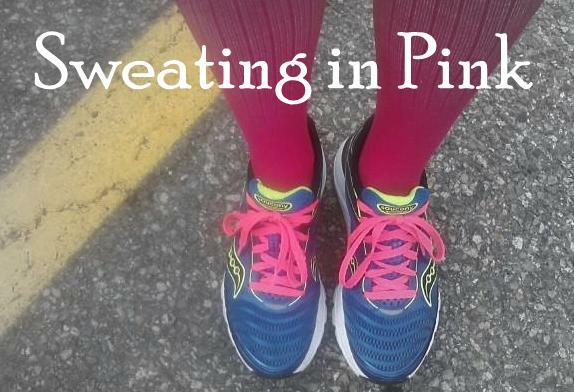 Check out how Sweat Pink shoelaces make my men's shoes prettier and faster! You should definitely check out Fit Approaches Ambassador pages and to check out my story. You can also join the #sweatpink race program. Check out the details here, but to make it quick and easy - you can do your fall race(s) sweating pink with an Sweat Pink t-shirt or tank and pink shoe laces, then celebrate afterwards with a Sweat Pink wine glass. You'll also get some pins to wear or sport wherever you so choose. I'll be running MDI in my #racepink. If you are interested in racing pink, register today! Are you interested in applying to be a Sweat Pink Amabassador? Apply here today! THANK YOU FOR CLARIFYING what the sweatpink is. I just got my tank and laces in the mail woo hoo! Congratulations Jen!! I can't wait to see photos from MDI of you racing pink! Same here!!! Still trying to decide if I'm going tshirt or tank....it IS mid October in MAINE.......you just never know. Maybe I need both. Congrats! Love the sweat pink mission! Awesome. Jenn (?) emailed me many months ago but I wasn't sure if I had time to promote and such and how it went with FitFluential. I'm glad to see so many doing both and promoting fitness. Love it! It's a pleasure, for sure. Pink goes with so much! Yes it does. I'm still a purple girl at heart - but pink looks great with purple, so I'm good with that! Congrats... those pink laces do look pretty amazing. Love my pink laces! Now I just have to decide what shoes to put them in! My new favorites for sure. Thank you! So happy to be on the team. Congrats. I just got in too. Seems like a very fun & inspiring group. Congrats!! I love this idea and it looks to be a great group of women!